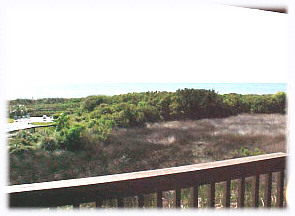 This direct oceanfront, condominium with kitchen efficiency, sleeps four to six. The bedroom has a queen-size bed and two stacked bunks for children/juniors. This condo also has a queen-size sleeper sofa, and offers cable TV, HBO, VCR, and stereo. Telephone with unlimited local calling is also included at no charge. 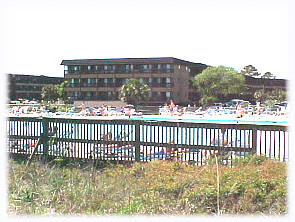 The resort has an oceanfront pool, pool bar with deck seating, and seasonal entertainment. It also features wide Atlantic Ocean beaches, ten tennis courts with full-time teaching pro, pro shop, seasonal children & children's activities/programs, onsite security, convenience store, and coin-operated washers and dryers. 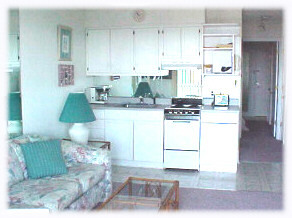 Please see http://vrbo.com/vrbo/4084.htm for our other web site.